In part 7 of this tutorial series on building DApps with Ethereum, we showed how to build the app’s front end, setting up and deploying the UI for this story we’ve been working on. It’s time to do some deploying and write a few final functions. This is the eighth part of a series on building decentralized applications using the Ethereum blockchain. The project we’re building is called The Neverending Story. The full project can be found at storydao.bitfalls.com. Its full code is on GitHub. In part 1, we bootstrap two versions of a local blockchain for development: a Ganache version, and a full private PoA version. In part 2, we build and deploy our TNS token. 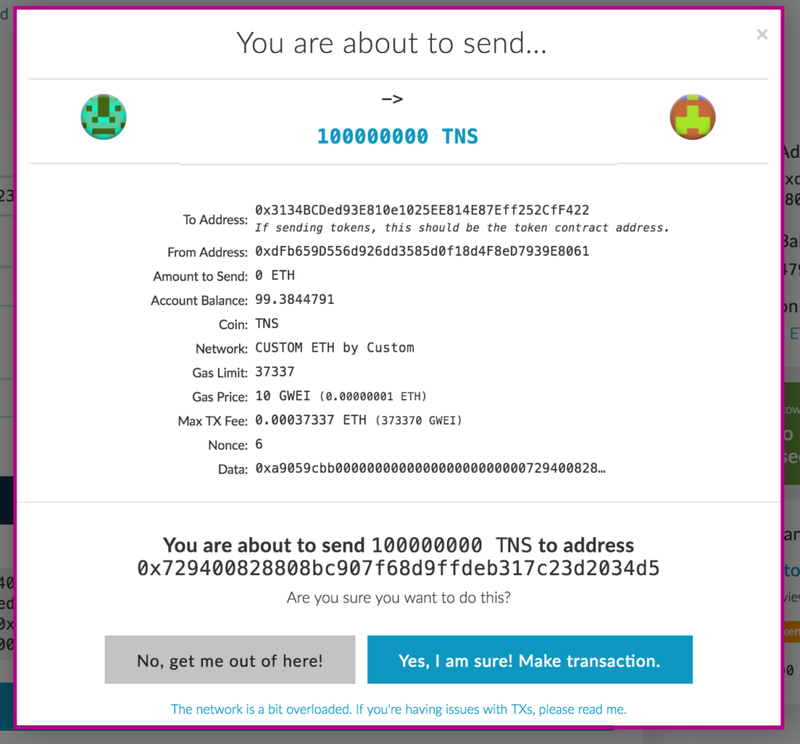 In part 3, we look at how to compile, deploy, test and verify our custom TNS token, which is compatible with all exchanges and can be used as a regular ERC20 token. In part 4, we take the first steps towards developing a Story DAO, covering whitelisting and testing. In part 5, we deal with adding content to the story, looking at how to add the ability for participants to buy tokens from the DAO and to add submissions into the story. 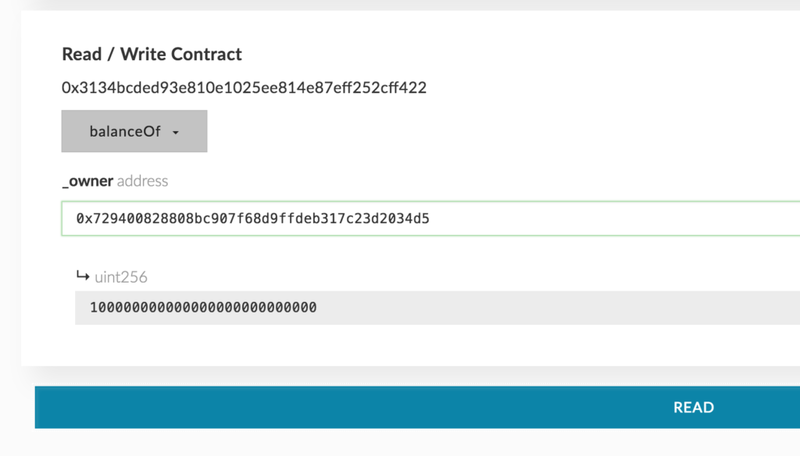 In part 6, we take the DAO to its final form, adding voting, blacklisting/unblacklisting, and dividend distribution and withdrawal, while throwing in some additional helper functions for good measure. In part 7, we show how to build the app’s front end, setting up and deploying the UI for this story we’ve been working on. In this final part, we look at the final steps of deploying the app and writing a few final functions. beyond this amount will be spendable. With the active-story block we added before (inability to run certain functions unless the story’s active flag is true), this should do the trick. No one else will be able to waste money by sending it to the contract, and everyone’s tokens will get unlocked. The owner doesn’t get the ether people submitted. Instead, the withdrawal function becomes available so people can take their ether back, and everyone’s taken care of. Now our contracts are finally ready for deployment. Calling it will disable the contract in question, removing its code from the blockchain’s state and disabling all functions, all while sending the ether in that address to the address provided. This is not a good idea in our case: we still want people to be able to withdraw their ether; we don’t want to take it from them. Besides, any ether sent straight to the address of a suicided contract will get lost forever (burned) because there’s no way to get it back. transfer ownership of Token contract to StoryDao. Luckily, this is very simple. It’s virtually identical to the Rinkeby deployment; we just need to remove the gas amount (let it calculate it on its own) and change the gas price. We should also change the network ID to 1 since that’s the mainnet ID. Get the address of the token and the address of the StoryDao from the deployment process. Then just use MEW as previously described to send the tokens. If you get Out of Gas errors, just increase the gas limit. Remember: the rest of the unused gas always gets refunded, so there’s no fear of losing any more money than your transaction costs (sending the tokens should be under 40000 gas). To transfer ownership, we need to call the transferOwnership function on the token. Let’s load the token into MEW. 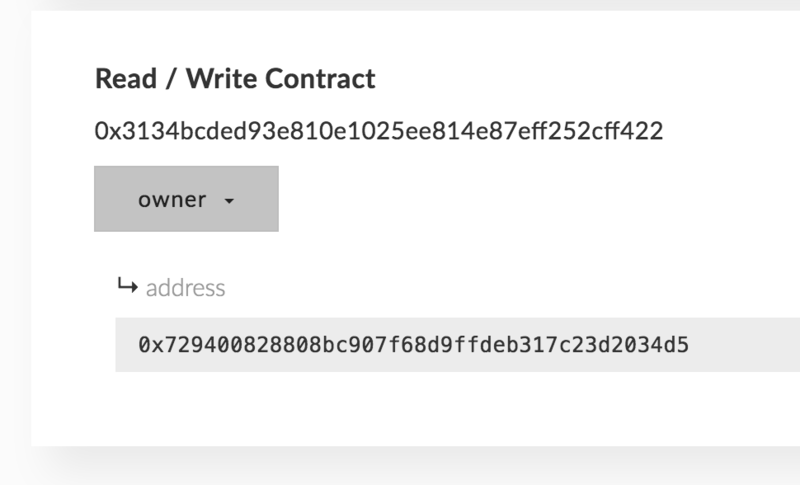 In the Contracts screen, we enter the address and the contract’s ABI (grab it from the /build folder). Clicking Access will then let us access the functions in that contract in a menu from which we select transferOwnership. Tip: it’s enough to only include the ABI of the functions you intend to call: it doesn’t have to be the whole ABI of the token! You could just include the ABI of the transferOwnership function and it would be fine! 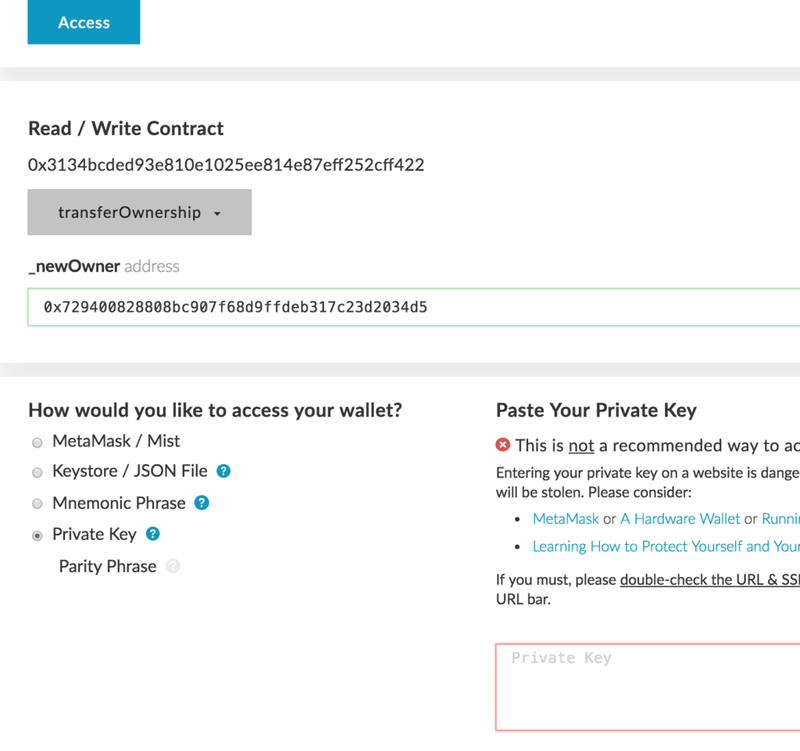 We then select the new owner (the address of the deployed StoryDao) and unlock the current owner’s wallet (the same wallet we previously sent tokens from). 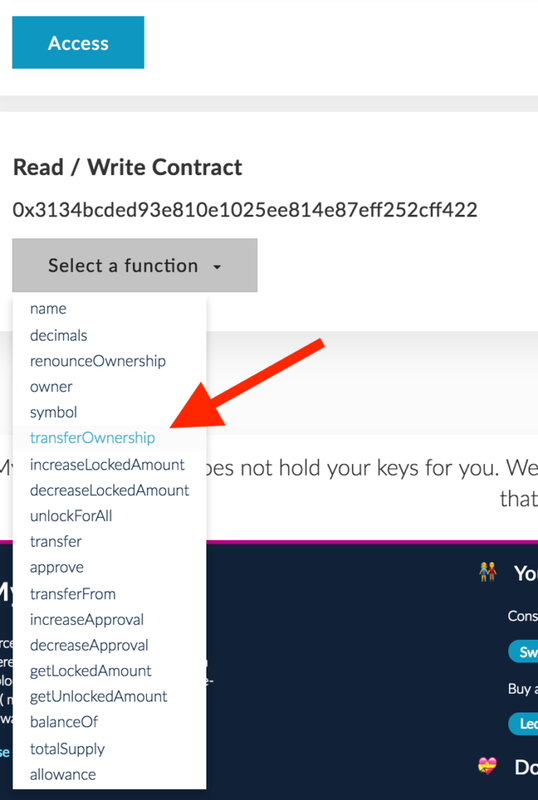 After writing this change, we can inspect the read-only function owner in the token contract (same menu as transferOwnership). It should show the new owner now. Indeed, 100 million tokens are in the StoryDao address. Tip: we could have done the token sending and ownership transferring as part of the deployment step as well. Try figuring out how in a test environment. As per part 3 of this series, it would benefit us greatly to verify the contracts of both the DAO and the Token on Etherscan. That green checkmark can go a long way. Follow the instructions in that part to get your contracts verified. Note that, during the verification step, you’ll now have to mark the optimizer as active, since we’re optimizing our code for cheaper deployment! To deploy the web UI of StoryDao, follow the instructions from the “regular” web development world. Since, in this case, it’s all static code, you can even host it on GitHub Pages or something similar. Read about some of the options here and here. 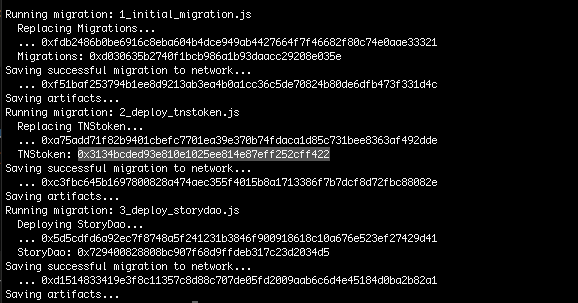 Once the page is up, configure the UI to use the addresses of contracts we got from the migration step. Alternatively, register ENS names for the token and the StoryDao, and you can keep the web UI static and fixed, hardcoding the addresses, and then only change the Ethereum address those ENS names are pointing at. This concludes the DAO tutorial. We hope it helped you recognize the complexities of Solidity development, but we also hope that it made some things clearer and made you more curious. As always, the best way to learn is by doing. Experiment, make mistakes, reboot and rebuild. Blockchain development of this type is in high demand, and it’s only getting more popular, so you have an opportunity to get in on the ground floor. P.S. If you enjoyed this tutorial, feel free to ping the author on Twitter. If you have complaints, suggestions, ideas, etc. please shoot them over into the repository on GitHub!